With a car at your disposal you can find all the, out of the way, quiet corners that most visitors miss out on. Finding yourself on a long stretch of deserted clean golden sand, with the clear turquoise blue of the Mediterranean lapping softly at your feet, can be quite magical. If you have children exploring new coves and beaches makes for a fun filled holiday for them and a relaxing time for you. Did you have a magical day out? or a romantic evening? Did you dance the night away in a great club?, or have you found a secret hide away? Just where did you go we need to know. You can tell us all here. Archaeological sites, and places of historic interest. They can be found all over the island all being well sign posted. A few that are worth a visit are listed below, in no particular order. Castell de Santa Agueda: Just a few kilometers from Ferreries and just off the main Mahon - Ciutadella road, more info here. Torre De Fornells: A coastal defense tower built by the British at the begriming of the 19th century. Can reached by foot from the Fornells. Opening times during the summer from 11:00 to 14:00. and 17:00 to 20:00 except on Mondays and Sundays, please check as times may vary. Castell De Sant Antoni Fornells: A Small defence castell, the building of it started the origins of Fornells itself. Ecomuseu de Cap de Cavalleria: The only known Roman town on Menorca, it is found on the northern tip of the island, west of Fornells. Open April, May, June and October from 10:00 to 19:30 July and September from 10:00 to 20:00. August from 10:00 to 20:30, please check as times may vary. Bar shop and small museum, a small charge is made, more info here. S'Hostal quarries in Ciutadella: Opening times are 09:00 until sunset, except on Sundays from July to August, when the visiting times are from 09:30 to 15:00 and from 17:00 until the sunset. More info here. Talayot De Dalt: Another fine Menorcan talayotic site situated down a well sigh posted lane at the 4Km marker from Mahon on the Mahon <-> Ciutadella road [ME1] Google maps. We all do it, spend two weeks just laying around the pool or chasing the kids up and down the beach. Here at Menorca the Guide we have always tried to get you off the sun bed and out into the real Menorca. Well now we've found another way to tempt you away from the pool, a 'good for the heart' brisk walk, or a lazy stroll. 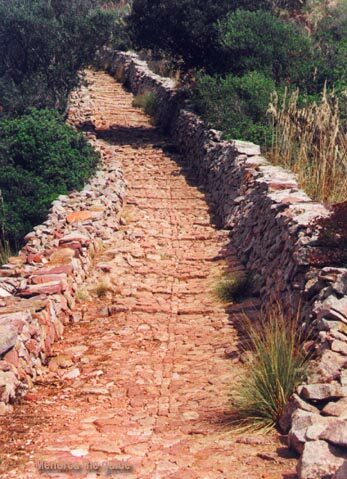 Menorca has some great countryside track ways and paths to explore, plus the coastal Cami de Cavalls pathway that encircles the entire island. In our walking section we have put together a few relatively easy walks, including directions and maps, plus maps for the full Cami de Cavalls. Castell de Santa Agueda Just a few kilometers from Ferreries and just off the main Mahon - Ciutadella road is Castell de Santa Agueda, it's well sign posted now. This ruin of a once roman stronghold is perched on top of the second highest point on Menorca. Cavalleria To the west of Fornells is an area called Cavalleria the whole area has been declared an area of special interest, not only because of the outstanding countryside, but also because of the number of archaeological remains that have been discovered here. A roman city, English watchtower, Muslim mosque, huts, fishing shelters and a limestone oven. This collection of archaeological remains form what is now known as Menorca's first outdoor museum. The ultimate aim is to protect and conserve the area for future generations. The excavations are not finished yet and each year from june to october you will find further attempts to discover more of the ancient Roman city of "Sanisera". In the museum you will find most of the more interesting archaeological finds. Archaeological sites can be found all over the island with all being well sign posted. 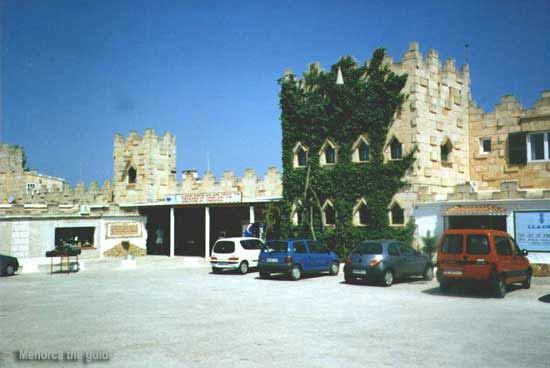 Some to note are Torre d'en gaumes near Son Bou, Taules de torre Llafuda just outside Ciutadella, Naveta de rafel rubi nou between Mahon and Alaior and the Taulad de Trepuco south of Mahon on the road to Sant lluis. Markets at Mahon every Tuesday and saturday, Ciutadella every Friday and Saturday, Es Castell every Monday and Wednesday, Alaior Thursdays only, Ferreries Tuesdays and Fridays. Most markets finnish around noon so get there early. Jazz at San Clement The Jazz club in San Clement holds a jazz night every Tuesday (and Thursdays in high summer). They have regular local players plus visiting professional and semi professional players that join in while they take there summer holidays in Menorca. Horse Riding for the experienced or first timers of all ages can be found at a number of riding school located all across Menorca. Horse are an important part of Menorcan life. The famous Menorca Horse Shows can be found on the road to Galdana there are two horse show centers with performances at 20:30 on various days. One of the best to see the skills of the horse rider in action, is at any of Menorcas fiestas. Mount Toro - No holiday to Menorca is complete without a trip up to the highest point on the island. As well as being the highest point it is also the spiritual center with the sanctuary built in the late 16th century and tended by a community of Franciscan nuns. Beside the Church at the summit is a large statue of 'Jesus of the Sacred Heart'. This is dedicated to The Menorcan's who died in the Moroccan war of 1925. Also to be found are other monuments to Menorcan's who emigrated to Florida and Algeria in the 19th century. The views over almost all of the island are quite spectacular, as Thomas & Hannah will agree. Coves d'en Xoroi The famous Caves of Cala n Porter through the day you can visit these caves have a drink and admire the view out to sea. But at 11 o clock they become a very popular night club playing all the latest dance music till the sun comes up. Aero club & Hippodrome Situated on the road between Mahon & Sant Luis. Has a Bar / Restaurant, Go-Kart track, snooker, pool & table tennis tables. There is a bridge club once a week on Wednesday at 8pm. You can also book aerial trips around the island (the ultimate island tour) The Hippodrome next door has Trotting races on Sundays. Aqua Park in Cala Forcat is a water park. It's not very big and really wouldn't be of much interest to the older child but it is perfect for 3-9 yr. olds. There are a few short flumes, slides etc. but what it lacked in excitement it made up for it in other ways. The park was extremely clean, the restaurant was pretty good value ( great pizzas ) and best of all it was very safe for the little ones ( enclosed, lifeguard etc. ) you paid one price which covered the whole day - under 3's free - and this included a bouncy castle play area. Throughout the day you could come and go as you pleased -they just stamped your hand so you could get back in. It opened at 10 am and shut around 6. The park can be found on the main road going into Cala Forcat - near to Hotel Los Delphines. We caught the bus there from Ciutadella which runs regularly. ( It stops right outside and your return bus picks up from the same stop ) I must say I thought the bus service was very good. They were clean, always on time and if the bus was full another was sent out within 5 minutes to pick up those left behind. Aqua Rock Cala Bosc water park larger than Calan Forcat, open till around 6pm Half price after 3pm. The park includes Four big slides, including the Black hole and the Kamikaze. One large pool with both walk-in and jump in areas. One small pool with smaller slides for the young ones. And a pool with a wave machine. Diving Menorca offers fantastic diving sights and S'Algar along with Binibequer, Cala Galdana, Port Addaia, Calan Forcat, Cala Bosc plus other resorts offer courses from "try a dive" to course over 5 - 6 days. They offer courses for both the complete novice to the experience diver wishing to improve his skills. Bowling can be had on the greens at S'Algar which has 7 rinks. Both novices and regular bowlers are welcomed and apart from recreational bowling there are weekly competitions. Woods can be hired locally. Cricket it may come as a surprise to find cricket as an activity in Spain but cricket was recorded in Menorca in the year 1813 by the surgeon of H.M.S. Scipio, being patronised by Admiral Lord St. Vincent, Commander in Chief of the British Mediterranean fleet. The tradition is carried on by the M.C.C, not the English version but the Menorca Cricket Club. The M.C.C. have purchased and developed their own ground at Biniparrell San Luis, where they can now enjoy the luxury of playing on grass. Every one is welcome to ether watch or participate in the games. Boat trips around the bay at Fornells and out to some spectacular coastal caves. Organ recitals at 11.00 am each day ( except Sunday's ) in the cathedral in Mahon on their beautiful 19th Century 2,300 pipe organ. Cost "Donation" to the cathedral. Cave bar at Cala En Porter is our 'must see' is the - horrible 70's cheesy disco facade hides a 'once in a lifetime experience'. It's literally just hacked from the rock and is massive inside. Gin Factory on Mahon Front 'a must go' also have a trip around Mahon harbor on the yellow boat! LITHICA just outside Ciutadella, on the main road to Mao - signposted from the road. It is the sandstone quarry of S'Hostal. LITHICA is a non-profit making cultural association whose objectives are the restoration, rehabilitation and transformation of the sandstone quarries as centers for cultural activities and scenic attraction. At the Ciutadella site there is a circuit taking about 40 minutes to complete that lets you see how stone used to be quarried and is quarried now. The deep modern parts of the quarries are amazing, totally awe-inspiring. In situ are quarrying tools and there is also a maze for children. The older parts of the quarry have been planted with trees and are a sanctuary for native wildlife. NAVETA DE'S TUDONS just outside Ciutadella (burial chamber in the form of an upturned boat) which can be seen from the road and further off the main road. Places to go - highly recommend the north coast which is less commercialised. Loved the area around Cala Morrell, also Cap De Cavalleria, Fornells, and especially Cap de Favaritx where the landscape takes on a certain lunar quality, and although the lighthouse is closed, there are stunning views by going round the perimeter (some scrambling over rocks involved admittedly). Also Es Grau - a lovely little village and Lake S'Albufera which is a nature reserve now. Everyone should go to the top of El Toro for the views - practically the whole island can be seen from there, and we also liked the totally white (although recently built) village of Binibeca Vel - lots of photographic opportunities there of little narrow streets and whitewashed houses. The above is just some of the many places to visit while holidaying on Menorca. A hirecar means you have the freedom to see the best Menorca has to offer. Remember there's more, lots more.